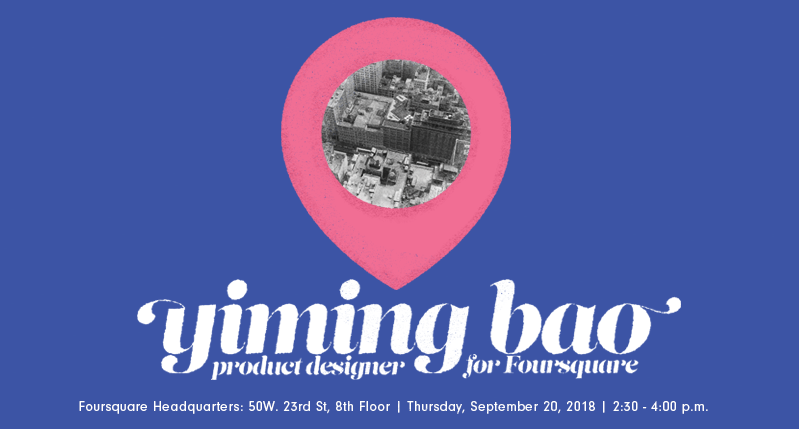 Today, this first semester’s first studio visit is hosted by Yiming Bao (MFAD 2014), Enterprise Product Designer at Foursquare. Yimiing has been issued patents for collaborative inventions: A design patent to broadly cover an innovative use of interaction-based animation for mobile advertising that we invented. See it in action in the Hyperscroller and Hyperplay, mobile ad formats exclusively available at Yieldmo. And. . . One variation of a method for serving interactive content to a user includes, at a visual element inserted into a document accessed by a computing device: loading a first frame from a digital video; in response to a scroll-down event that moves the visual element upward from a bottom of a window rendered on the computing device toward a top of the window, seeking from the first frame through a subset of frames in the digital video in a first direction at a rate corresponding to a scroll rate of the scroll-down event, the subset of frames spanning a duration of the digital video corresponding to a length of the scroll-down event; and, in response to termination of the scroll-down event with the visual element remaining in view within the window, playing the digital video forward from a last frame in the subset of frames in the digital video.